Sparks from the forge of a rough thinker. Literary, moral, and religious. Cleveland : Printed at the Pub. House of the Evangelical association, 1880. Description : [1 l.] frontis., -231 p. ; ill.: 1 phot. ; 21.2 cm. Photograph : albumen portrait mounted to leaf with hand ruled gilding. Subject : Physician memoirs — Addison Porter Dutcher. Author caption: By Addison P. Dutcher, M.D., Author of "Selections from my portfolio," "Pulmonary tuberculosis," etc. Medical degree, N. Y. College of Physiology and Surgery, 1839. Private practice, Cooksbury, N. Y., 1840. Private practice, New Brighton, Pa., 1841-. Private practice, Enon Valley, Pa., -1864. 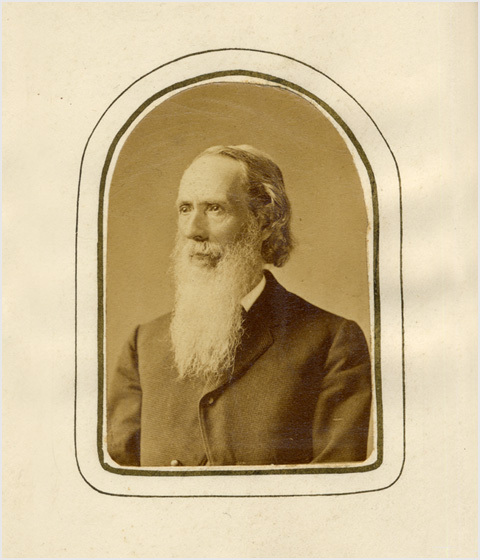 President, Beaver County Medical Society, 1863. Chair, Clinical medicine, Charity Hospital Medical College, Cleveland, 1864. President, Cleveland Academy of Medicine, 1868. With biographical excerpt from Atkinson (1878), Physicians and surgeons of the United States. Philadelphia: Robson ; p. 96-97. Scarce, 6 copies listed in Worldcat. Except for one essay titled, "The duty of the physician to the dying," the book is entirely expository writing that has very few medical or case anecdotes. Before he enrolled at the New York College of Physiology and Surgery, Dutcher trained under Dr. Edward H. Dixon, who also believed in the physician's mandate to comment on societal problems beyond the periphery of health care; although Dixon was the cleverer and did not stray so far afield as Dutcher. Most of the 58 essays appeared at one time in the Cleveland Ohio, Evangelical Messenger.